WCCP (Web Cache Communication Protocol) is a content routing protocol developed by Cisco that allows you to redirect traffic in real time. A typical use case for WCCP would be if you have a proxy or load balancer that you want to redirect traffic to, all transparent to the end user(no configuration needed on browser). Each WCCP setup has at least one WCCP client and one WCCP server where the proxy would be the client, and the Cisco switch/router would be the server. An access list on the switch/router defines which traffic should be redirected via WCCP, and which traffic should flow through as normal. WCCP allows for easy scaling, fault tolerance, and load balancing. The load balancing piece of WCCP gets a little involved so let’s take a look at how that works. In the case when you have more than one WCCP client, maybe you have two web proxies, WCCP provides built-in load balancing. The way that WCCP determines which traffic is sent to each proxy is through the use of a Mask value that it applies to the IP addresses as they pass through the redirect on the switch or router. 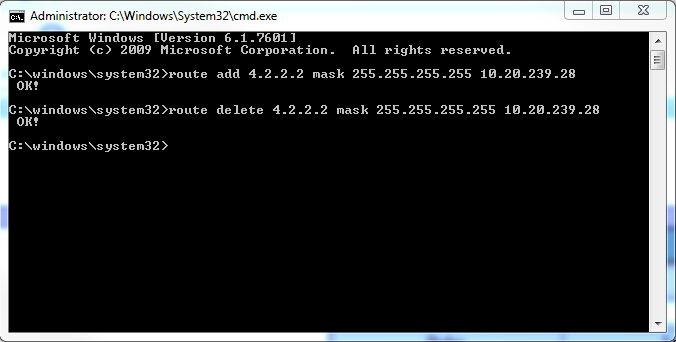 Whether the mask gets applied to the source or destination IP is controlled by a setting on the WCCP client. Where does the mask get set? It’s set on the WCCP client, for this example we’ll use a Websense proxy, which sets the default value to the hex value 0x1741. The logical product of the mask and IP address, produces a value which will be called the bucket. The buckets then get evenly distributed between WCCP clients, and your traffic is distributed accordingly. Confused yet? Let’s break it down piece by piece. First let’s convert everything into binary. For this example, let’s use the source IP 192.168.100.5 and the default Websense mask of 0x1741. 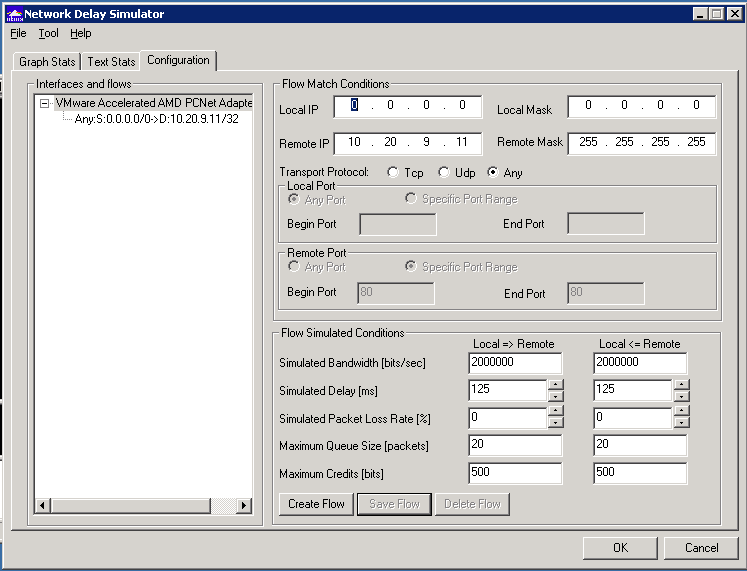 Let’s perform a sample logical AND. Logical AND means that any any place there is a ‘1’ in both columns of the source IP and mask, it will generate a ‘1’ in the result. Any other combination(0 and 1, 0 and 0, 1 and 0, all equal 0). So the final result(Bucket) is 00000000 00000000 00000100 00000001, or 0x401 in hex. If you took different source IP addresses and went through the math to logically AND them together you would end up with different resulting buckets, but only 64 buckets total(2^6). 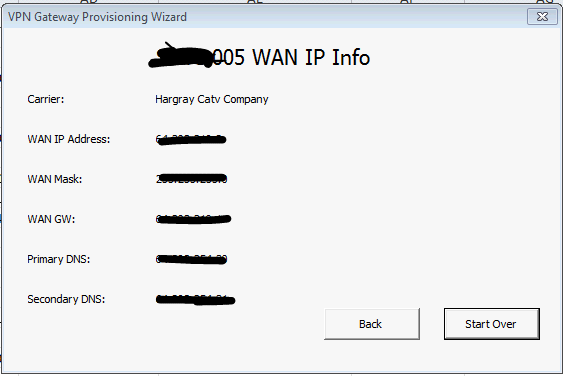 Here is the output from a Cisco switch that was connected via WCCP to two proxies(10.20.30.40 and 10.20.30.50) using the default mask 0x1741. You can see that it split up the 64 buckets into two groups (buckets 0 – 31 assigned to WCCP client ID 10.20.30.50) and (buckets 32 – 64 assigned to WCCP client ID 10.20.30.40). I added a couple comments in bold and highlighted the row where the resulting value was 0x401, from our example. A mask of 0x0, we end up with one bucket(2^0=1), which means there could only be one proxy, and no load balancing would take place. A mask of 0x1 (00000000 00000000 00000000 00000001), we end up with two buckets (2^1=2), with even numbered last octet IP addresses going to one proxy and odd numbered last octet IP addresses going through the other proxy. We do not recommend using the WAAS default mask (0x1741). For data center deployments, the goal is to load balance the branch sites into the data center rather than clients or hosts. The right mask minimizes data center WAE peering and hence scales storage. For example, use 0x100 to 0x7F00 for retail data centers that have /24 branch networks. For large enterprises with a /16 per business, use 0x10000 to 0x7F0000 to load balance the businesses into the enterprise data center. 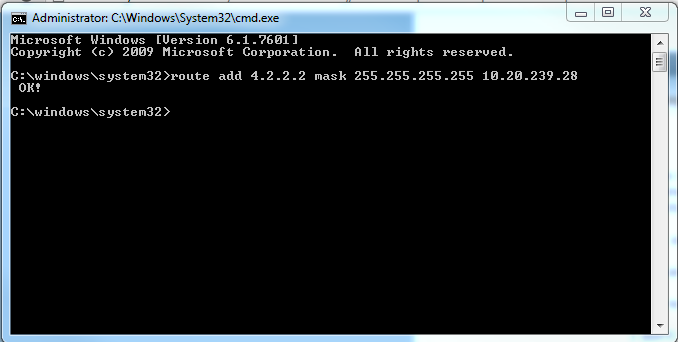 In the branch office, the goal is to balance the clients that obtain their IP addresses via DHCP. DHCP generally issues client IP addresses incrementing from the lowest IP address in the subnet. To best balance DHCP assigned IP addresses with mask, use 0x1 to 0x7F to only consider the lowest order bits of the client IP address to achieve the best distribution. Choosing a mask that works best with your environment allows you to have better control of how traffic will be distributed between proxies and makes it much more deterministic so if for example you choose 0x1 as your mask you know that any clients with even last octets are going through one proxy and all the odd last octets are going through another proxy. During troubleshooting if you get reports that users are having issues possibly related to the proxy, by knowing what their IP ends in you can quickly correlate if all the odd numbered IPs are having an issue but even numbered IPs aren’t that Proxy A may need to be looked further. When deploying an IPS appliance I saw a challenge that might come up if you are installing the IPS appliance in addition to a web proxy. One of the by-products of using the default settings of the proxy is that all user traffic going through the proxy ends up being NATted to the IP address of the proxy prior to going to the firewall. Normally this wouldn’t cause a problem but when you want to setup the IPS appliance to look at all traffic between the inside and firewall it presents an issue. We lose visibility into what the original client IP address is, all traffic appears as it is coming from one single IP address of the web proxy making IPS logs less useful. In an ideal situation you would be able to place the IPS in a position where it would examine the actual source IP address but not all networks may be able to accommodate this. One workaround is to utilize the x-forwarded-for header option on your proxy. There is an industry standard(but not RFC) header available for HTTP called x-forwarded-for, that identifies the originating IP address of an HTTP request, regardless of if it goes through a proxy or load balancer. This header would typically be added by the proxy or load-balancer, but it’s worth noting that there are plugins out there that let a web browser insert this field(whether it is real or spoofed). Once this header is added it allows some IPS appliances/software to inspect the x-forwarded-for header and report on the actual client IP address. Snort currently supports this and there is more detail here. I believe that other IPS appliances such as Cisco’s Sourcefire also supports this option through enabling the HTTP inspect preprocessor and checking ‘Extract Original IP address’ option. Will work on confirming this and updating the post sometime soon. If you want to look at this traffic in wireshark there is a display filter ‘http.x_forwarded_for’ that will let you filter on x-forwarded-for. I’d like to point out that the x-forwarded-for header gets carried in the packet out into the Internet which may or may not concern some people as it releases more information about your internal IP addresses structure than you might have wanted. I tried to see if there was an ASA feature to strip this header out but couldn’t find anything that looked like it fit besides this Cisco bug report/request for the feature. Also, as mentioned above you can spoof this header pretty easily, it is not authenticated or signed, and is presented in plain text. Each deployment will be unique and you’ll have to weigh out the risks and whether this is a feature that is worth implementing for your specific environment. The DNS request/response had to come back to the US, which takes about 300 ms RTT. That’s 300 ms extra time added on to however long it takes to load your site. Since the DNS request was taking place in the US, any website that uses a service like Akamai or some other geographical load balancing was serving up the sites closest to the US. So you wind up with Internet traffic leaving the office in China locally, and then still coming all the way back to the ‘best’ server closest to where the DNS resolution was done in the US. Really no better then you were to start. This presented a problem. How do we perform DNS lookups for all of the Internet sites using some local Chinese ISP DNS, while still sending DNS requests for internal sites and websites to our own internal corporate servers. A quick google turned up a Cisco feature called split DNS which did exactly this. The concept behind split DNS is pretty straightforward. Cisco allows you to setup multiple DNS views, each with a different DNS server, that directs traffic based on certain parameters that you pick. To make this work you also end up changing your clients to point to the router interfaces themselves for DNS servers, and the router then forwards on the request to the appropriate DNS server depending on the criteria you set. In our case we were using the Cisco router for DHCP as well, so we modified the Cisco DHCP scope to include the router itself as the DNS server. Once this config is in there, it works like this. Anytime a DNS query from a client comes in to the router, it will look to see what site you are trying to go to. If it matches the ‘name-list’ in our example, so say intranet.yourdomain.com, it will then know to use the ‘corporate-internal’ view and forward that DNS request to the appropriate internal servers. If the domain name you are trying to reach does not match the name-list, for example google.com, then you will fall down to the DNS view called ‘default’ in the view-list, which will forward your DNS request to a different set of DNS servers. After making these changes we saw pretty impressive improvements. We got rid of the 300+ ms RTT for the DNS request itself, and in addition we were now getting geographically appropriate results for the DNS queries which means that the servers returned to us were usually much closer, and therefore quicker. There are a ton of other options and complexity you can add to this feature. If you are interested in learning more check out this Cisco page to get started. 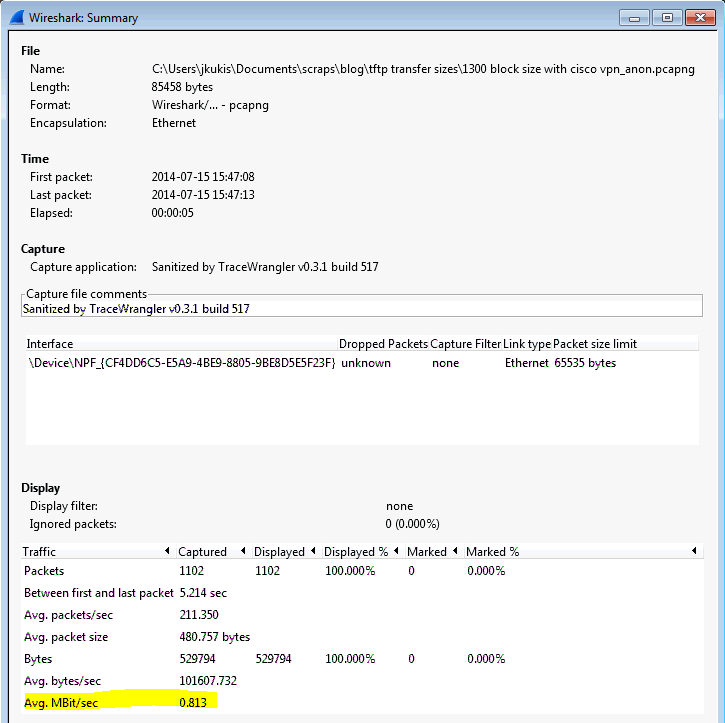 Packet captures are an important part of the network engineers toolkit. They provide a look into what is really going on in your network and help get to the bottom of troubleshooting an issue very quickly. In addition to getting to the bottom of a problem, they also serve as a great learning tool to get a better understanding of how different protocols work, and more importantly how they work in your network. A company called QA cafe has a really great product called Cloudshark, that allows you to manage and analyze your packet captures without installing any software like Wireshark locally. Everything is handled in the web browser. I wanted to write a quick post to take a look at the available options from Cloudshark and how they might work best for you. Cloudshark really worked to get as many features from Wireshark into the web based product, to the point that sometimes you forget that you are working in a web browser. When you first login to the product you are presented with a page that has a list of your currently uploaded files, as well as a place to upload new files, or search for a saved capture. The interface is clean, and easy to find what you’re looking for. For a full list please see this page at Cisco. 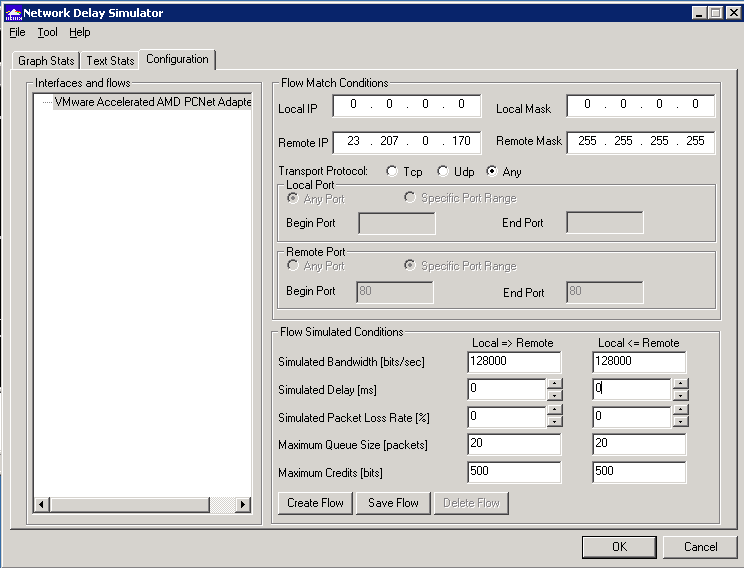 Netdr is a debug tool included with the 6500 platform that allows you to capture traffic going to/from the route processor or switch processor. Unlike other debugs that come with huge warnings of terrible things that could happen if you run them, netdr is generally considered to be safe. You can run it on a switch that already has very high CPU without any additional negative impact. The goal here is to see what type(s) of traffic are hitting the CPU and causing it to be so high, and then ultimately track that traffic down and stop it. There are a number of really good articles written on Cisco’s site and other blogs on how to use netdr to troubleshoot high cpu. Start here, and then use some Googling to fill in the missing pieces. I don’t want to reinvent the wheel here so I’ll leave how to use the tool to some of the other sites out there. You can scan the output and see that all the pieces of a typical frame and packet are in there, Things like src/dst MAC, src/dst IP, protocol, and some data in hex format that isn’t easily readable. 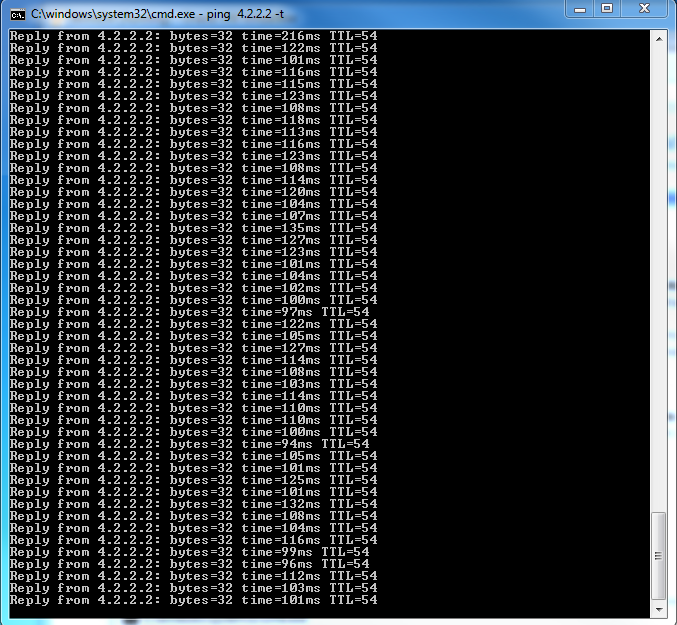 If you need to repeat this for a large number of packets it gets very tedious. 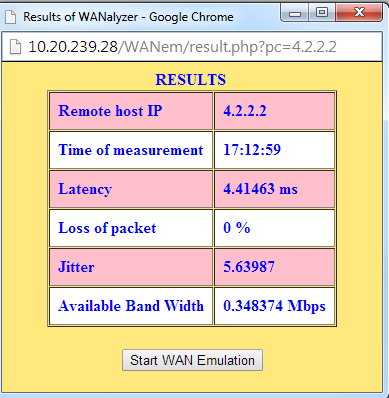 I found (stumbled upon) a great tool on Cisco’s site that makes this all much easier. On the Cisco tools site there is a link to the NetDR Parser. When you first get to the page it gives you the option of pasting your output into the window, or uploading a file that contains netdr output. If you have a lot of netdr data to go through I’d recommend you redirect the output to something like a tftp server using ‘show netdr capture l3-data | redirect tftp://a.b.c.d/netdroutput.txt’. That way you don’t need to worry about logging your ssh session or copy/pasting. Once you get your NetDR output into the tool you click the ‘Parse Data’ button and the tool goes to work. 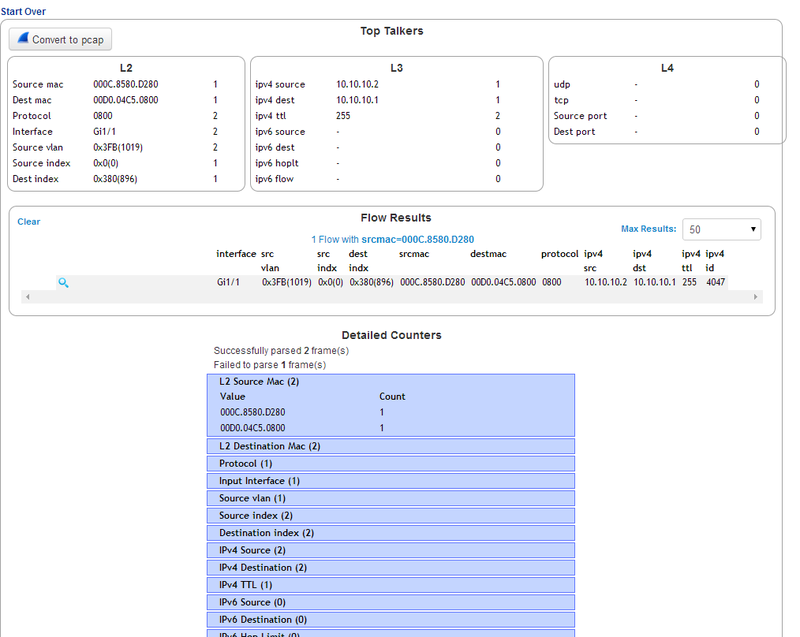 The results page gives you a Top Talkers section similar to Netflow, with the top L2 and L3 talkers. It also has a detailed table where you can expand any of the rows by clicking on them. This sample above was based on some netdr output I found on another site, it only contains two packets. If you want to see this in an even more familiar format you can click the ‘Convert to PCap’ button which will export a .pcap file for you to open in wireshark for further review. 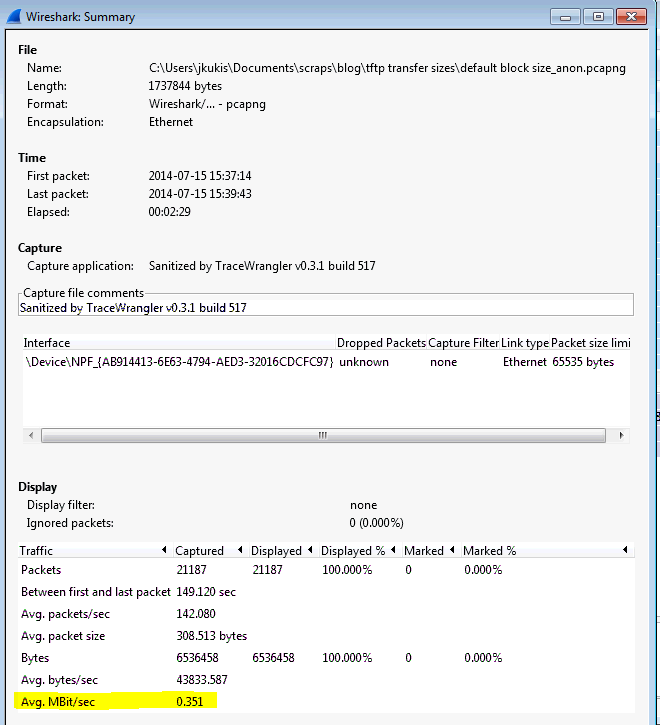 Now you can use any of the standard tools built into Wireshark to analyze the captured data. 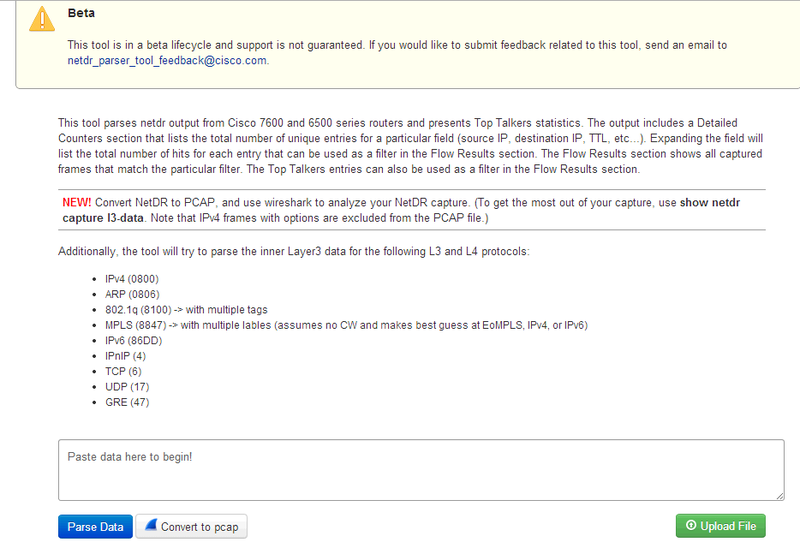 I think its great Cisco came up with this tool to help parse the netdr output. Gives the customer more power to initially troubleshoot without needing to jump immediately to TAC for support. As part of the same project I wrote this python script for, I created an Excel/VBA script to allow our team to quickly and consistently input all of the data required for the VPN hardware we were shipping out to over 450 locations. The output of this Excel spreadsheet would later serve as the input to the Python script I wrote, and combined they are working out very well. Before I dive into the Excel/VBA code I’d like to give a little bit of background on my thoughts on why this was worth getting into. From my experience, it’s fairly easy to come up with the configuration for a single site, or even a couple of sites. You have the time to verify everything is correct, put everything in by hand, and really dedicate the time to check everything is how you want it. This gets more difficult as you scale in size. Even at 10 or 20 sites you start to increase your margin of error for a typo here or there, or you might run out of time and not be able to check everything as well as you would like. Once you start to get into hundreds of devices to configure it makes things that much more complex. It’s now very difficult, if not impossible, for a single person to manually configure each location and requires a very large amount of time dedicated to a single project. If you take the time to automate a process, whether it is with a script, Excel, or some other combination of tools you can reduce the number of human errors as well as reduce the time and resources that would otherwise need to be dedicated to the project. 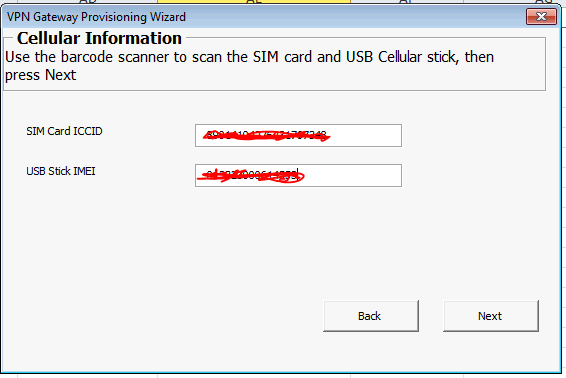 If you had a site that fell under ‘option 1’ then it required entering in the public IP address information for that site, as well as keeping track of the cellular SIM ICCID and IMEI numbers. If you had a site that was under ‘option 2’ you would only enter in the public broadband IP address, but would not need to package any cellular USB sticks. If you had a site with ‘option 3’ then you would not have any broadband IP information to enter, but would need to package a cellular USB stick and record that information down. Doing any of the above manually would be very labor intensive, flipping between multiple spreadsheets to check the type of setup the site would have, figure out which information to record and ship out. So, we automate. Every VPN hardware appliance has a barcode on the box that includes the MAC address of the device. We can use a barcode scanner to scan that box and do a lookup of the MAC address in Spreadsheet #1 which will give us the site ID we are working with. Prompt the user for the appropriate required information, depending on which type of configuration the site will get. For example, if the site will need Broadband and cellular, then display the fields for broadband IP address and cellular information. If the site will be getting a T1 with cell backup, don’t prompt the user for any broadband information. At the end of the script, tell the user which instructions to package with the device before it gets shipped out. 2)Prompt the user for the appropriate information so it can be saved to a database. Detected this was a broadband/cellular site. Prompt the user for the appropriate information. 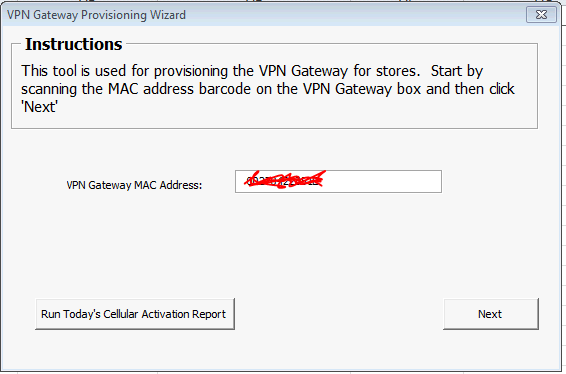 3)Present the user with all of the necessary information for that store so they can enter it into the VPN gateway. Present the Broadband IP address information to the user for this specific site so they can enter it into the VPN hardware appliance.